My ten year old step-son and four year old daughter. 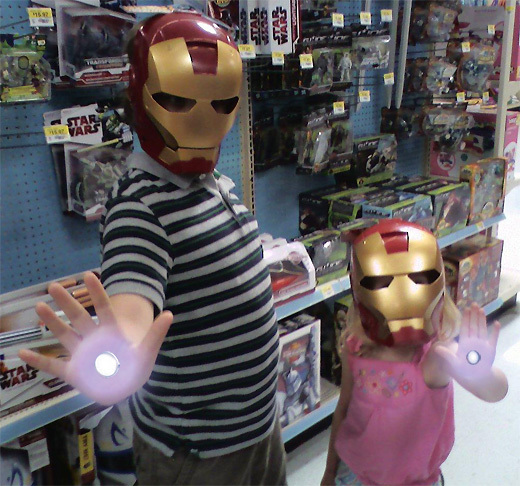 Forget Tony Stark, they are Iron Kids! how did the Rascal (and you ) like the new movie? Nice Photoshopping there. You forgot the triangle on the chest though. 44 – Rascal hasn’t seen the second movie yet. He just watched the the first one last week (he’d never been interested before that). I imagine we’ll go see the second one soon. Ed – Photoshopping? What are you talking about? My kids have cybernetic Repulsor-hands. Doesn’t every kid nowadays? To tie in with your Iron Kids, check out Iron Baby. Verily cute! I especially like Iron Man in pink. LOL – they are very cute!